Your gift can make it possible for the US Chess Trust to provide the benefits of chess to more people than ever —including more schoolkids and more veterans. Those benefits can widen their worlds, challenge their minds, and improve their lives. Chess helps kids perform better in school. It teaches them valuable life lessons. It shows them the value of study and logical thinking. And it shows them that they can compete with anyone. Last year, the US Chess Trust Sets for Youth and Sets for Vets initiatives sent a record number of official chess sets and boards to start and expand school and community clubs. This year we expect to send more than ever! Your donation will also help us bring the same benefits to older Americans as well. Research, as well as actual experience, suggests that chess benefits the mental acuity of people of all ages. The Chess Trust is sponsoring the upcoming Conference on Chess and Education that calls for research and papers. Your donation will help us continue to support the prizes at the National Girls Tournament of Champions, the Arnold Denker Tournament of High School Champions and the Dewain Barber Tournament of K-8 Champions. These three events give young state representatives a well attended, well organized platform of their own. The US Chess Trust provides two $5,000 scholarships, as well as cash stipends. This year, the US Chess Trust also supports the new Tournament of Senior Champions that take place beside the three junior invitationals during the first four days of the US Open traditional schedule. Samford Fellowship Supports USA Talent! The US Chess Trust also funds the Samford Fellow- ship, through the generos- ity of the late Frank P. Samford, Jr. Its goal is to give exceptionally promis- ing American chess play- ers an opportunity to develop their talents. The total value of the Fellow- ship has been increased several times over the years and is now $42,000 annually. Four of the five- man, medal-winning 2018 US Olympiad team are Samford graduates. Another new project your donations assist is the Oral Chess History of the USA project. Through US Chess Trust funding, the Chess Journalists of America will capture the remembrances of chess personalities central to the development of chess in the US—and make them available on our website and at the World Chess Hall of Fame. 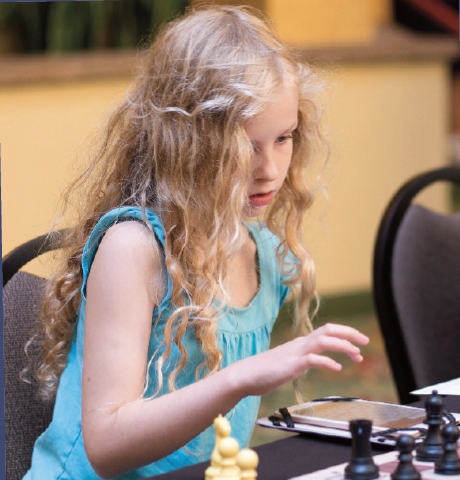 With the assistance of the National Scholastic Chess Foundation, the Trust provides the five annual $1,500 Scholar Chess Player college scholarships. We also support the Pan American Intercollegiate Chess Championships and fund the Final Four of College Chess, the playoff for the US collegiate championship. The Trust also selects and supports the induction of our most accomplished players and writers into the US Chess Hall of Fame in St. Louis. Those are some of the programs you’ll support with your donation. We know there are lots of worthy causes asking for your help during the holiday season. But we hope you agree that our causes provide a high value return. Members of our board of directors take no compensation. Your donations are tax-deductible, and you can earmark them for your favorite programs. We welcome donations to honor the memory of friends and loved ones. You’ll get a letter of thanks that will also serve as tax documentation, and you’ll see your support recognized on our website. Or give to us through the Combined Federal Campaign — our ID number is 10212. You can also remember the US Chess Trust in your will. To discuss a codicil to an existing will, please contact Al Lawrence. Please help others share the advantages of chess. Please join us in spreading the benefits of chess by making your tax-deductible donation today!